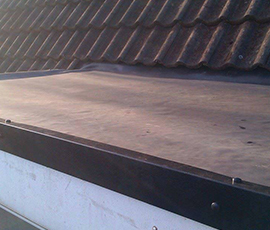 We live in a technological world and one area of construction that has certainly benefited from this is flat roofing. In years gone by you only had one choice of surface - roofing felt. Well, things have moved on quite a bit with other high quality and durable materials often being preferred. Among these are EPDM rubber and fibreglass. Most of the flat roofs we install or repair are completed with these new, hardwearing products with felt still being used as required. Whichever you choose, they all come fully guaranteed; providing effective waterproofing and pleasing appearance. Why not call Azza's Roofing Services to discuss the best option for your flat roof? What flat roof options are there? All of these are available from Azza's Roofing Services. They are all virtually maintenance-free, easy to apply, very durable and weather resistant.